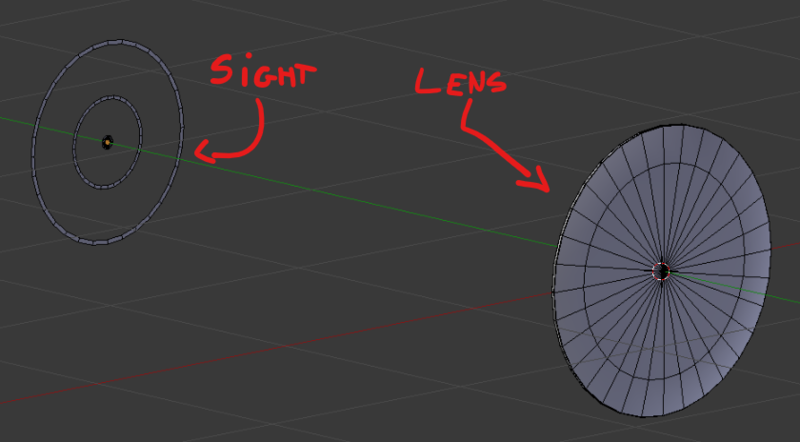 Does anyone have a lead on how to set up a shader in cycles to mimic the behavior of hologhraphic sights in blender, as shown in this image? I don't want to have to try and figure out exactly how to get the lenses and reflectors etc. physically correct because there seems to be no public knowledge of how exactly it's done. I'm thinking it will probably have to involve some vector math, but I don't know how to do it. From what I could understand with a little research, holographic/reticle sights display a holograph that appears (when looking through the sights glass) to be fixed to a spatial position a certain distance (d) from the center of the graph. Basically, we need to work out the x,y coordinates of the point d distance down the camera ray for each point we render on our sight. We can then use that to map our texture. 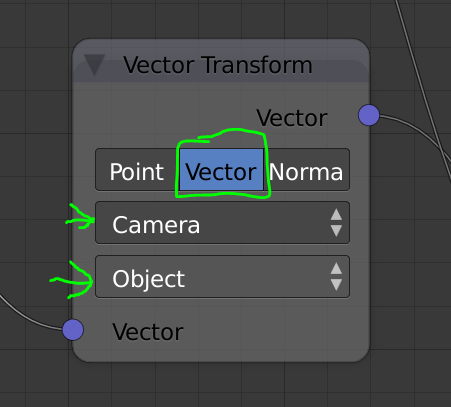 This would be a piece of cake if we had matrices in cycles nodes (in particular, the transform matrices of the sight object and the camera, as well as the projection matrix). We don't, so lets improvise. 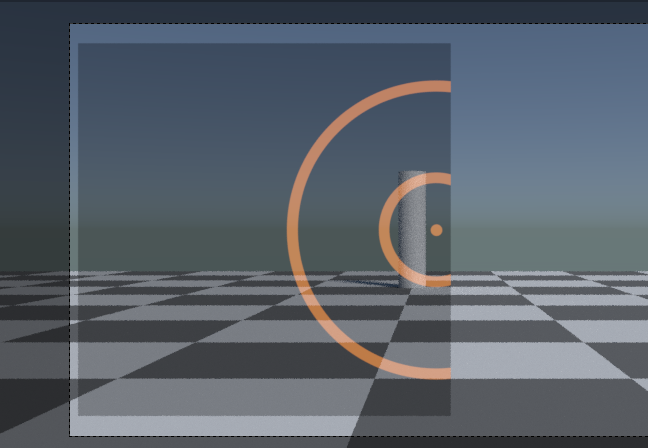 The camera data node (which is where you'd expect to find the view and projection matrices) is a good starting place. While we don't see any juicy matrices, we do get one vector. 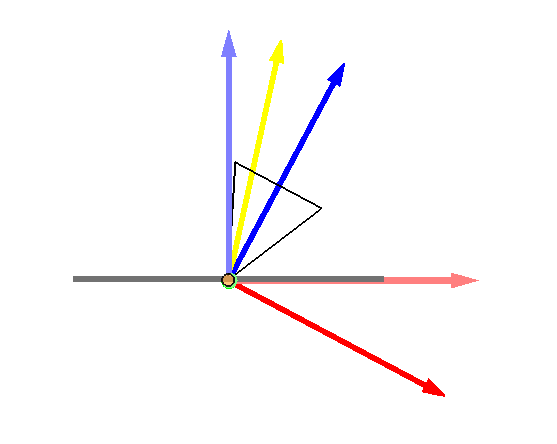 The view vector provides a vector representing the ray that was shot out to hit that point of our mesh. This direction is in camera space. Therefore Z is always forwards, x is always left/right, and y is always up down. Each vector is normalized, so they always have a length of one. Lets visualize this a bit. We'll do this in 2D because I can't draw this in 3D it will be easier for you to understand. Looking at our camera top down in camera space, z is forwards (now up relative to our view), and x is left to right. This is drawn with the dark colored axis. 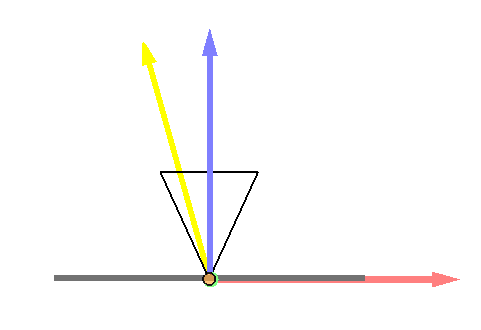 If we look at our ray (in yellow) which has a length of 1, you will see that it can be broken up into an x and a z component (light colored axis). This is the ratio of x to z movement needed to travel down the ray. I am available to illustrate geometry textbooks. Basically, we need to work out the x,y coordinates of the point d distance down the camera ray for each point we render on our sight. 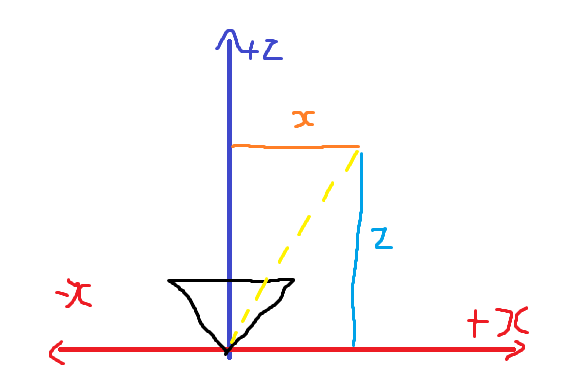 If we multiply the View Vector by d, we will get the x,y coordinates of a point d distance from the camera in that direction. Progress! However, our sight is now fixed to the camera. We can improve this, using the vector transform node. To explain exactly how this space conversion works, we will need to understand object space. Object space is where the origin of our space is the origin of the object, and all the axis (plural) line up with the objects local axis (plural). Pretty simple. Our sight just needs to be d distance down the z axis is object space. So how does this space conversion work? If you will direct your eyes to my next graphic (again drawn looking top down), you will see that a plane as been added (our sight), and the camera has been rotated. In light colors are the axis of the object space, and in dark the axis of the camera space. We can see that the ray, which is in camera space, is pointing the wrong way. If we apply the inverse of the camera's rotation to the data, the ray will go back to pointing the correct direction. This is what the vector transform does. To fix this, we need to take position into account. The object texture coordinate give the object space location of the ray/mesh intersection. Since our rays are traveling at the right angle, all they need is to start at the right place. If we take the object space coordinate, and travel d distance along the ray direct (in object space), we will get our desired x,y coordinates. This can be achieve simply be Adding the two vectors together (using the vector math node). 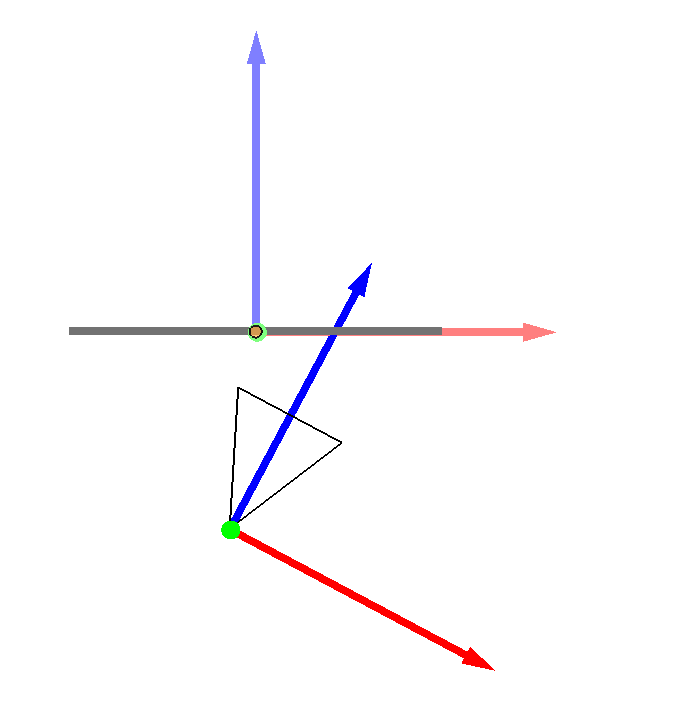 We take the view vector, transform it to object space, multiply it by the distance d (scalar multiplication). We then add it to the object texture coordinate. I created my own vector clamp and scalar multiply node groups. Those can be obtained in the provided blend file. This is a pretty robust shader. It handles object rotation, scaling moving, and zooming (focal length changes) in stride. The scope texture will always be centered around the object origin, and be visible when looking down the z axis of the object. Because the output of view vector is normalized, the output x,y coordinates used to map the texture will be projected along a sphere d distance from the objects origin, rather than a plane. This shouldn't be too noticeable. Pity they don't let the user decide whether it should be normalized. You will need two objects. Lens and sight. Place them as you will do it for gun without holographic sight. For lens use just Glass Shader. For sight use mix between sight material (could be anything, I've used just Emission Shader) and Transparent by Light Path > Transmission Depth. This will create material that will be visible only trough glass. Note: Do NOT shoot innocent monkey! Not the answer you're looking for? Browse other questions tagged cycles rendering texturing nodes shaders or ask your own question. Creating a gravity lens effect? Is there a way to separate colors from chained mix rgb nodes? Efficient video workflow without multiple renders? How to stack/layer two textures with alpha over each other with Material nodes? 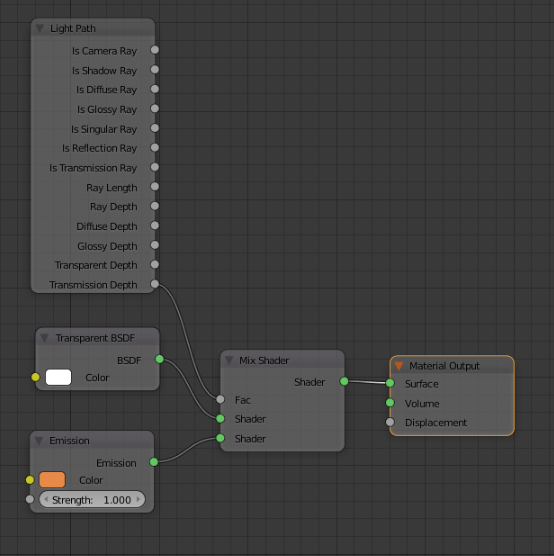 Way to convert PBR “glossy specular” > “specular” (color value) for cycles nodes group?